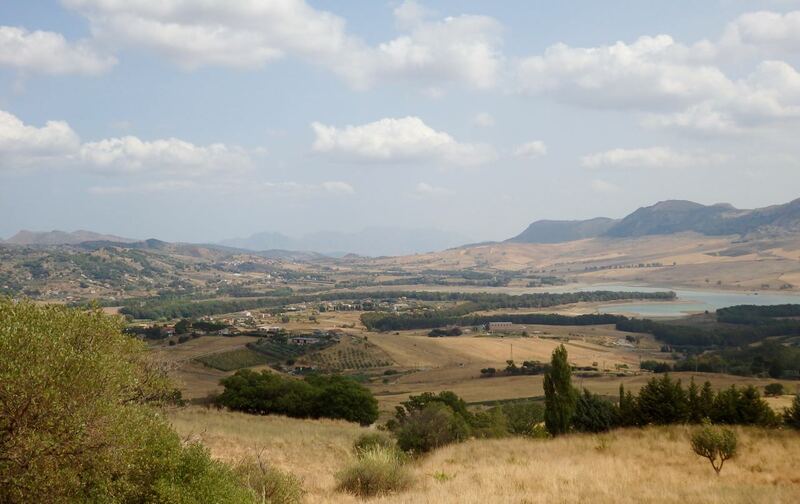 Sicily is one of many places referred to as the “crossroads of the Mediterranean”. In the case of Sicily, it’s an apt description considering its geographically central position. In ancient and medieval times, successive waves of invaders, immigrants and refugees – including Phoenicians, Greeks, Romans, Arabs and Normans –have left marks on the island. Even today, significant traces of these civilisations are apparent, not least in architectural structures and food. 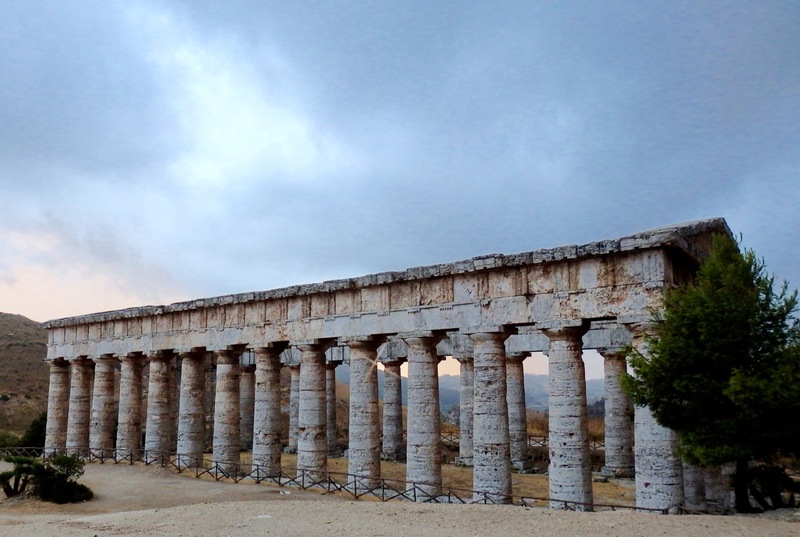 Greek temple at Segesta (5th century BC). Arab-Norman church of San Giovanni degli Eremiti in Palermo (6th century AD). Yet another stream of people who made their way to Sicily, but one usually overlooked, is that of the Albanians. They first arrived on the island, and elsewhere in southern Italy, in the 15th century, fleeing the Ottoman Turkish occupation of their homeland and the fear of forced Islamisation. Unlike the influence of earlier groups of migrants to Sicily, Albanian culture had little or no obvious impact on wider society. That said, in those relatively isolated pockets of the island where Albanians settled, clear elements of the culture they brought with them have been maintained to the present day. Although there are said to be one hundred or so communities of Albanian origin scattered around southern Italy, only a few of these retain any truly meaningful characteristics of their ancestors. 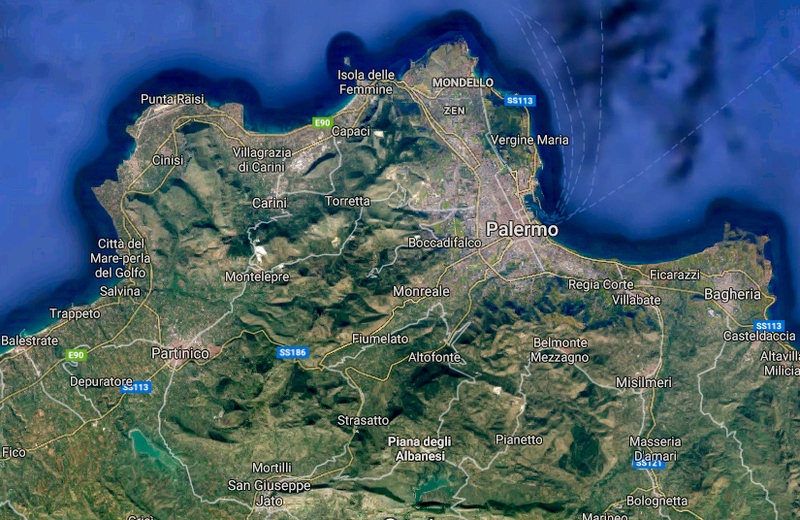 One place that has is the small town of Piana degli Albanesi, located just 25 kilometres inland south of Palermo, the Sicilian capital. Piana degli Albanesi is located almost due south of Palermo. Farmland around Piana degli Albanesi. It takes less than an hour to drive from Palermo to Piana degli Albanesi (usually simply referred to as “Piana” – or, to Albanian speakers, Hororës së Arbëreshëvet), following a road that winds its way through the steep mountain range that once served as a barrier between the Sicilian capital and the interior of the island. It is largely thanks to this relative isolation from the outside world that Albanian identity could be maintained over the course of many centuries. Someone quickly passing through the town is unlikely to notice anything particularly distinctive. On the face of it, Piana looks and feels like countless other modestly attractive Sicilian hillside communities. 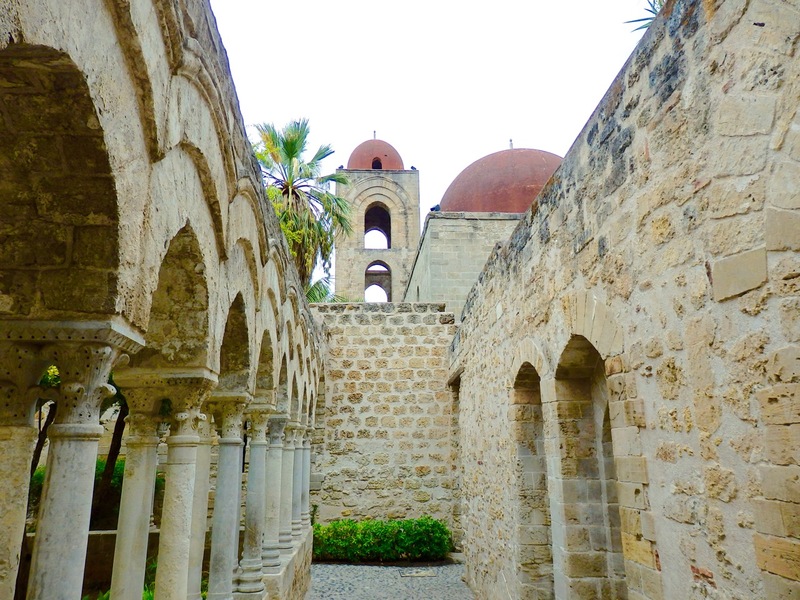 There are several churches and chapels, a prominent war memorial, an ornamental fountain on the main piazza and an abundance of houses with closed shutters, a reminder of the high levels of outward migration that have long characterised Sicily. 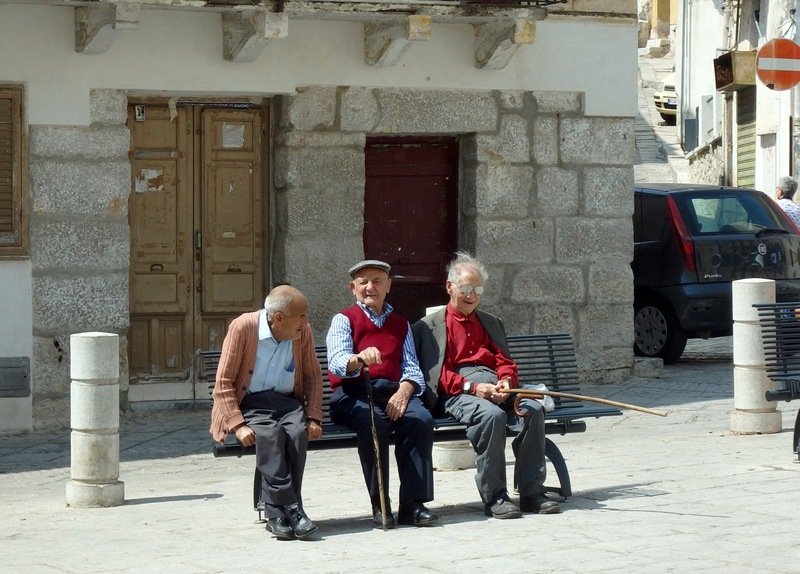 As with other such places, elderly women and men appear to represent a disproportionate share of the resident population. It is not, in any case, Piana’s Albanian identity that draws most visitors. Instead, the main attraction is the town’s famous cannoli, tube-shaped, deep-fried, crispy pastry containing an intensely sweet, ricotta-based filling. What marks out Piana’s cannoli is in part their quality but also their large size. Although cannoli are made and sold throughout the year, as ricotta is a seasonal cheese, connoisseurs of these pastries insist that they are at their best between November and May, when local pastures are greenest and the grazing sheep produce the sweetest milk. Still, even a casual wander around Piana reveals clues to its Albanian heritage. Yes, the main piazza is named, as is quite typical across the country, after Vittorio Emanuele, the first king of a united Italy – but the main road leading to the piazza is Corso Giorgio Kastriota, named in honour of an Albanian leader of the 15th-century resistance to the Turkish conquest. 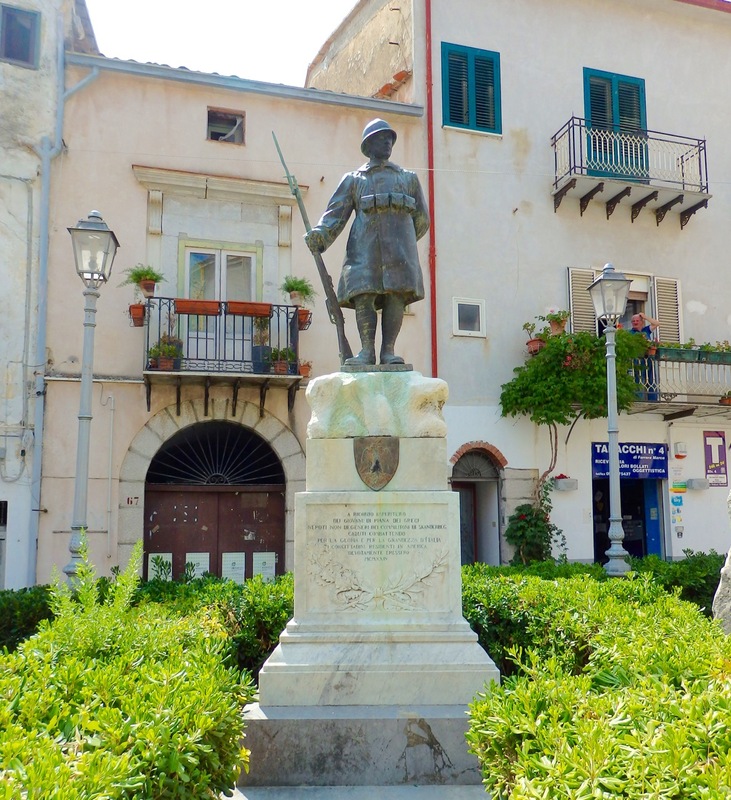 Beneath the imposing statue of an Italian soldier that’s located alongside this road are listed the names of local men who lost their lives in World War I, the Italian first and (mainly) Albanian family names serving as reminders of the dual heritage of the community from which they came. 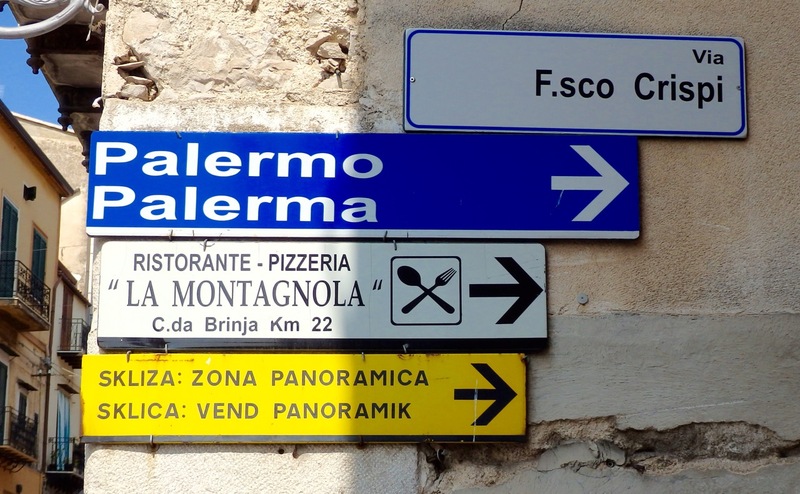 In contrast to the absence of bilingual (Italian/Sicilian) signage elsewhere in Sicily, many direction, shop and business signs in and around Piana are inscribed in both Italian and Albanian. As for the spoken language, enter a bar and you’re just as likely to hear local people chatting to one another in Albanian as in Italian. Tasty though local produce is, it’s impossible to identify anything distinctively Albanian! Rather than the Albanian language, however, to be more precise it is Arbëresh that most locals use between each other. 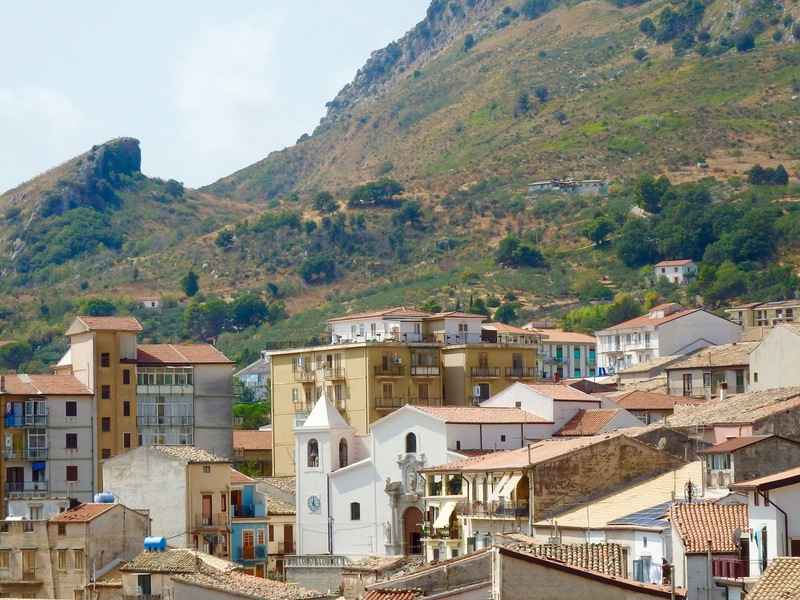 As Sicily’s Albanians were for centuries largely isolated from the land of their ancestors, a distinct dialect emerged that is based on Greek-influenced medieval Tosk of southern Albania, onto which have been grafted Sicilian and Italian elements. Following the downfall of Communism and the breakup of Yugoslavia in the early 1990s, a significant number of refugees and immigrants from Albania and Kosovo arrived in Piana, exposing for the first time the local population to contemporary forms of the Albanian language. This period coincided with the official recognition of Arbëresh, which is now used to a limited extent in elementary schools and local administration. 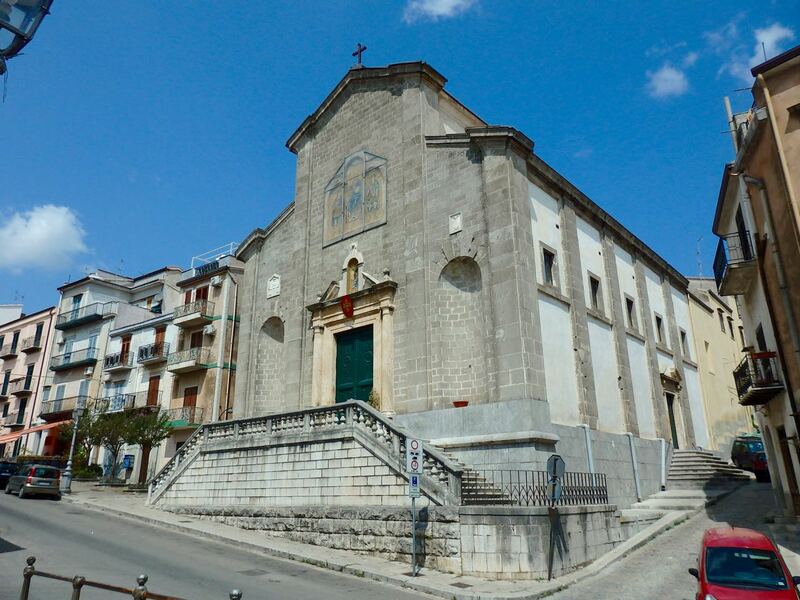 Regarding Piana’s cultural landscape, what’s more immediately noticeable to visitors is that instead of Roman Catholic churches and chapels, places of worship here are those of the Italo-Albanian Byzantine Catholic Church. In addition to a cathedral, there are nine Albanian churches in this town of just over 6,000 people, while there are also several chapels serving the outlying rural districts. All are adorned with Byzantine icons, their priests celebrate Byzantine liturgy in the Greek and Albanian languages, and incense is burnt in quantities that surpass even that used in traditional Roman Catholic rituals. Cathedral of St. Demetrius Megalomartire of Thessalonica. Church mosaic in the Museo Civico Nicola Barbato. 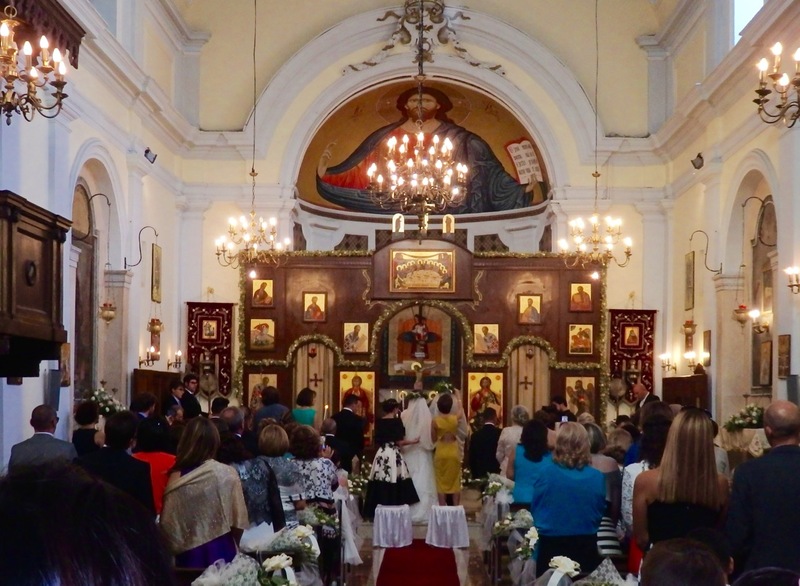 A wedding in San Giorgio Megalomartire Church. As well as serving as the community’s spiritual bond, the Italo-Albanian Church has been central to the preservation of the Albanian language. Such a link between religion and language maintenance is far from unusual, given the power that churches can wield when the membership is drawn mainly or entirely from a particular ethnic group. In such cases, the church hierarchy can insist that worship is conducted in the ancestral language, for reasons of tradition and as a means of exerting control. A shop selling Albanian-style souvenirs. 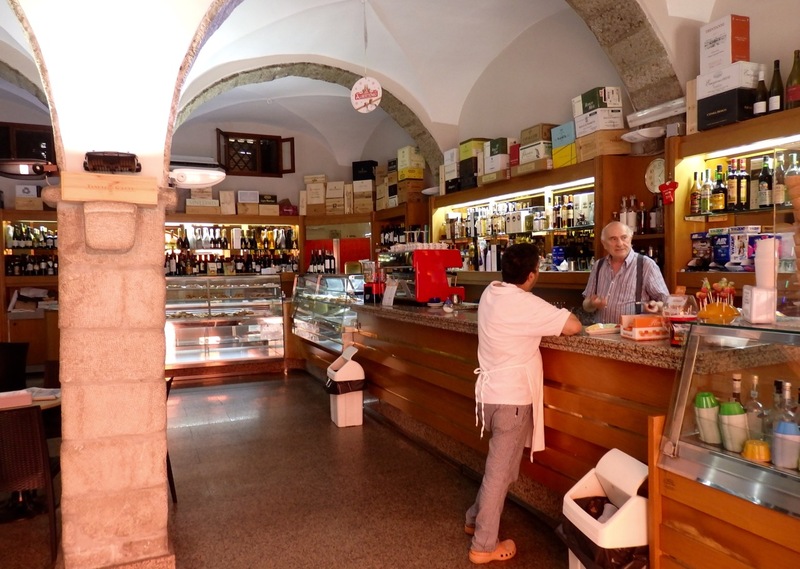 Apart from entering the churches (when they’re open), the best way to catch a glimpse of local culture is to visit the Museo Civico Nicola Barbato. 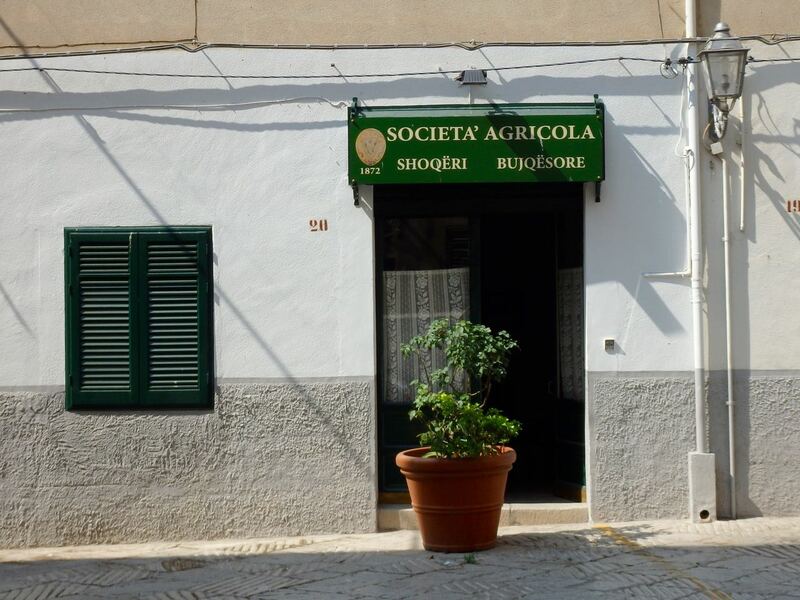 This well-organised local museum features a collection of old domestic and farming implements that are much the same as those found in similar museums across the Mediterranean. What is special, however, are the displays of traditional costumes, not least the intricately embroidered items of the kind that local people wear, even now, during local festivals, most notably during the Easter celebrations of Holy Week. 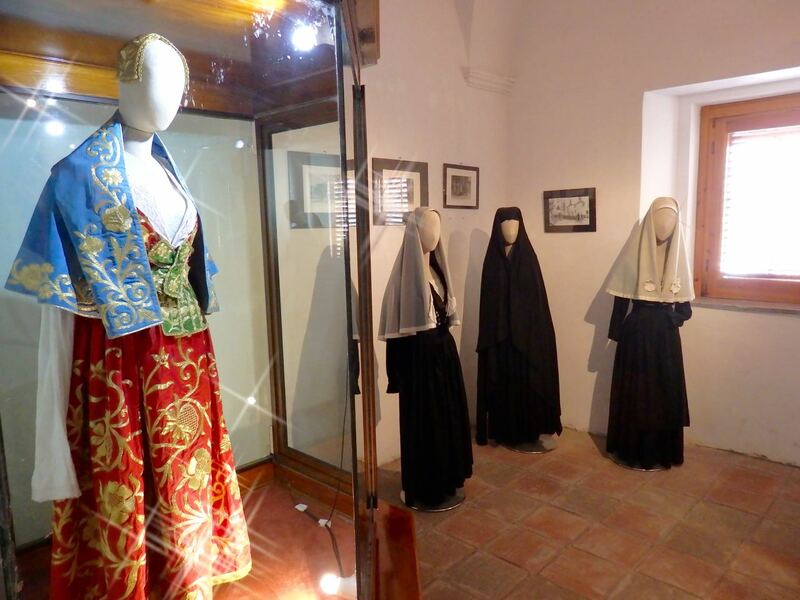 Traditional costumes in the Museo Civico Nicola Barbato. 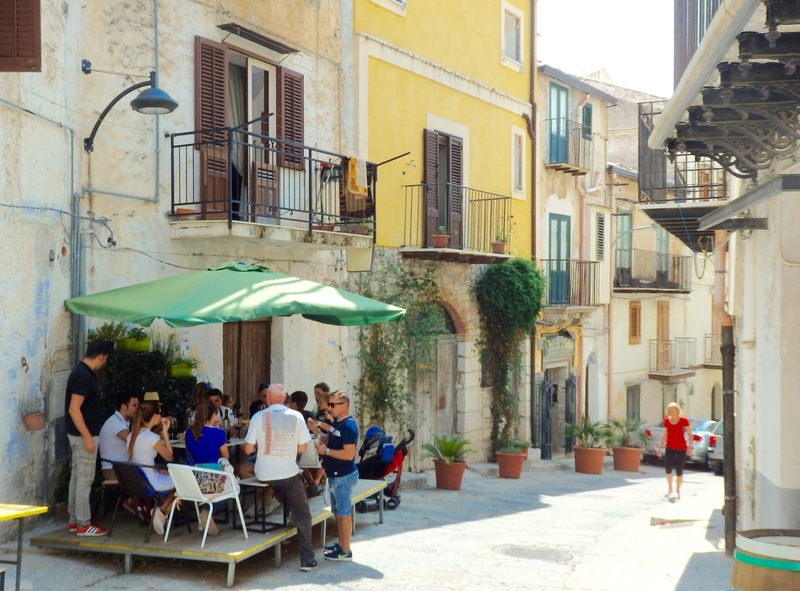 Over the course of countless generations, Piana degli Albanesi has developed a unique Balkan-Italian identity within the setting of a seemingly ordinary Sicilian town. It’s impossible to know to what extent its distinct character will be maintained, but given that Albanian culture has been central to local life for some 500 years, there’s no reason not to expect Albanian influences to survive for a good while longer. Outstanding post, Oliver! I’d read a bit about Greeks and Normans, but knew nothing about the Albanian presence, very interesting. 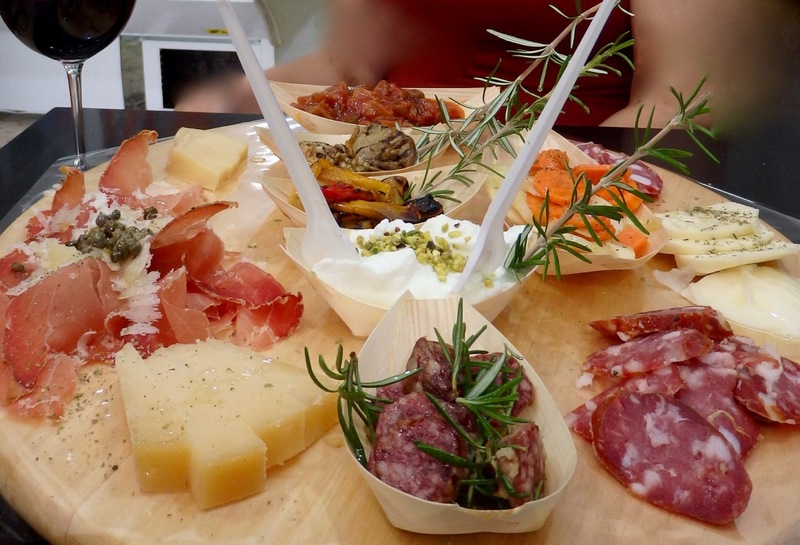 I would be very happy to visit a place famous for giant cannoli, and the prosciutto and salami look pretty great, too! (And it’s still two hours until lunch). I was struck by just how ubiquitous the Italo-Albanian church must be in this community – – a cathedral and nine churches for a village just a bit larger than the one I grew up in! I’ve been here a couple of times over the years, researching the Rough Guide, but Piana was always a tough sell to readers who were understandably more inclined to head straight for Greek temples and Norman church mosaics. As you say, not a lot to see at first glance. But your post just goes to show you should always dig deeper! If I ever get there again I’ll go with a more enthusiastic spring in my step! Thanks, Jules – I remember you from my Rough Guides years! 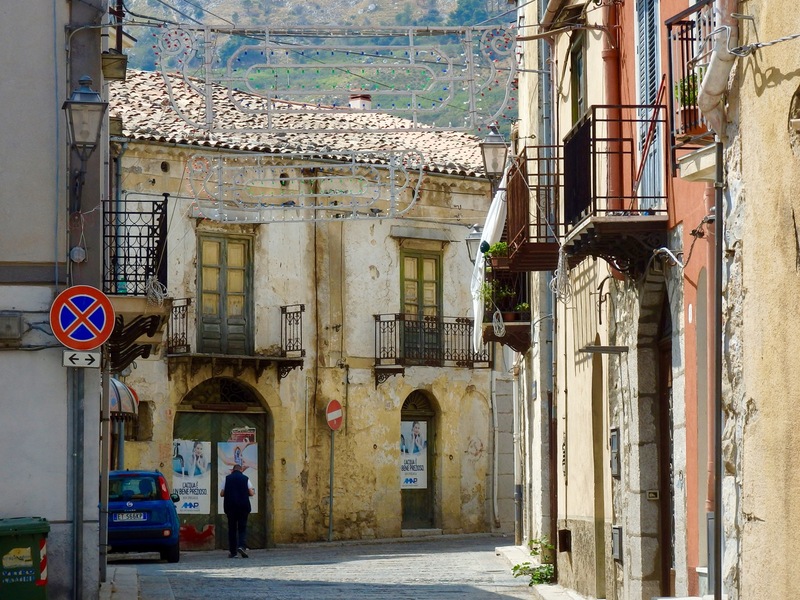 Yes, even though Piana is prettier that many a Sicilian hill town, it’s easy to pass through with barely a second glance. That’s a mistake! My paternal great-grandparents, who lived in Piana, settled in New Orleans in the late 1870’s. I know very, very little about the Stassi family. My grandmother was already in her eighties when I came along, and I was too young to make inquiries. This article and accompanying photos were wonderful and much appreciated. Thank you so much, Charlene. What an amazing family history you must have. I wonder why and how your great-grandparents came to settle in New Orleans…. Was that their actual destination? Were they on their way elsewhere? Fascinating! Some of the Stassi family also settled in Madison Wisconsin. My dad was a 1st cousin of Sam Stassi. My grandparents also left Piana and settled in New Orleans, but in 1903. For many years, New Orleans was the major port of entry for most Sicilians coming to the U.S. Many came to work on the plantations, as there was need for cheap labor after slavery ended. They often saved enough money to open their own grocery stores in NOLA or to buy their own farmland outside the city, selling their produce in the French Market. Many became strawberry farmers north of the city. Thank you for this, Darlene. This is another reason why I must visit New Orleans and southern Louisiana!